Margherita Franchi was the daughter of Giovanni Francesco Franchi and Maria Ressi, at Probezze in the diocese of Brescia, Italy. She had two brothers and a sister, all of whom pre-deceased her. After entering the Missionary Sisters of the Society of Mary, she took the name Sr Marie Giovanna and made her first profession at Ste Foy-les-Lyon, France on 9th March 1950. Just over a year later, on 23rd March 1951, Sr M. Giovanna and Sr M. Carla sailed from Le Havre France, via the Suez Canal to New Caledonia in the ship Biraken. 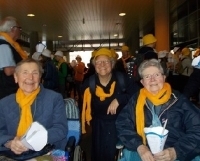 Forty five days later they arrived and Sr M. Giovanna was assigned to St. Leon seminary, Paita. 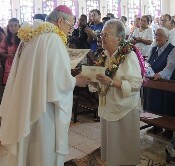 She stayed at the seminary for many years and many of them remember her with gratitude for her humble and devoted service. Sr M. Giovanna had many gifts and talents, especially cooking, sewing, knitting and embroidery. 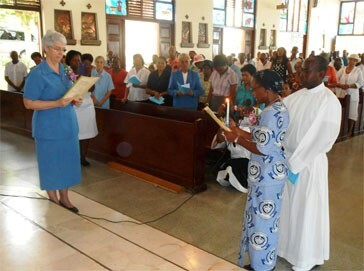 Wherever she went, Pouebo, Mont Mou, Kouma and La Foa, she knew how to use her gifts for the benefit of others. This was the case when she made two mitres for Archbishop Calvet. She asked to see an old mitre, examined it carefully and then made not one but two for the Archbishop. 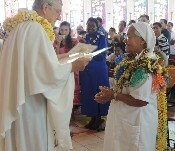 While at Paita, at the end of the year, Sr M. Giovanna would have a sale of her handicraft and the proceeds were given to students from Vanuatu who were studying in Paita. The first time, Sr M. Giovanna was in La Foa, she was teaching Home Economics including sewing and cooking. Many, including the sister of Sr Michele Bernut, remember her patience in teaching them to sew. Sr M. Giovanna was always happy to share her knowledge and her skills in all simplicity. Sister was a very thoughtful person who was always ready to thank others and to offer her help. 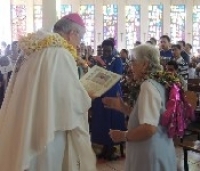 The priests she worked with in different places remember her with affection, including two who are now bishops, Bishop Ghislain de Rasilly in Wallis and Bishop John Bosco Baremes in Port Vila. 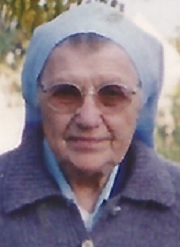 Not only was Sr M. Giovanna loving towards persons, but she was also a great lover of animals especially cats and birds. 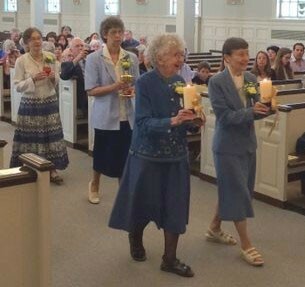 All who spoke of her recalled the kindness and the gentleness of Sr M. Giovanna. She was truly a woman who served others like Mary, humbly and discreetly, while remaining “hidden and as it were unknown in the world”.